Area rugs give a room a comfy feeling. Rooms with an area rug are much more inviting and cozy. Rugs are great for protecting your hard wood floor, and also provide as a non slick surface. Most area rugs can be repositioned in moments, helps keep your house or office, always versatile and put an emphasis on areas you like the most. Rugs are beautiful! And come in all kind of shapes, sizes and colors,they are great for decoration and remodeling. Area rugs help to reduce noise distractions, either its noise between floors, or in an office environment rugs are great for scuffling sound. Feng Shui effect, the ancient Chinese method for keeping a balance in your home and office, recommends area rugs are recommended as to add a soothing impact. A few rug cleaning tips our experts have learned through the years and we would like to share with our loyal customers. Vacuuming should be done regularly and is essential to keeping the fabric of your rug in top condition, you should vacuum your rug in both directions and do it as often as possible. A good vacuuming tip is to change the vacuum bag often as the vacuum loses its strength in time. Rotate your rugs at least once a year, this helps to prevent uneven wear, that can be caused from direct sunlight or high amounts of traffic. Try to always use a non-slip grip for the underline of your rug, this will help to insure your rug will age better and less wear. Common spills and pet urine are a severe problem which should be dealt with immediately, if left for drying your rug may suffer from a hard to neutralize odor and the chemicals in the urine may discolor the rug. To help you deal with emergency spills our own rug cleaning experts have some advice, you should first try to dry out the stain and extract as much liquid as possible with paper towels, then rinse out the stain with a lot of water, and you may use a carpet shampoo but beware of low quality products which my harm your carpet. In cases of pet urine it is advised to use some compound that includes vinegar as to absorb the terrible odor. We do advise contacting our own experts by the phone and setting up a meeting to estimate the damage free of charge. There are a lot of dust particles and other forms of dirt that are hiding within your rugs that can very easily be missed by the untrained eye. Unfortunately, this means that the lifespan of your rug will be significantly reduced and you will not even be aware of it before it is too late. That is why it is essential you contact the experts at Tulip Cleaning Services for a full and thorough cleaning to ensure your rugs last as long as possible. We specialize in the most advanced techniques of rug cleaning, be it steam cleaning or shampoo cleaning, our technicians will examine your rug and determine its fiber and stains, then choose the right method and product for the job. Our own custom developed Ph testing kit, will reassure the right shampoo is being used in cleaning your rug, as other cleaning solutions may not be so stable and will harm and even shrink your rug. 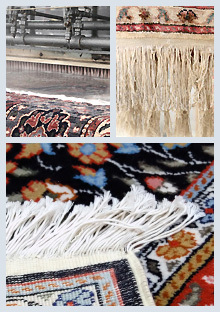 We provide an extensive rug repair service, our experts will pick up your rug, no matter if it's an oriental or Persian special rug or any other kind of fabrics, if possible we will deal with the rug cleaning process on-site. We inspect the rug thoroughly to determine all the damage that was done including the stitches and fringe of the rug, if dyeing in needed we provide it too. Restoration work is also possible. We will evaluate the cost of a restoration process and call you for your preferred method of restoration. We provide a special wrapping for storage service for your clean and repaired carpets. Tulip Cleaning Services has been cleaning and repairing carpets and area rugs for the last decade, we offer our expertise and experience in a very affordable and appealing cost. Check out our own special coupons page for even more attractive offers, call at this number 858-437-9300 to claim coupons today!